I really like ginger. For the longest time I hated it – I found it had too much of a bite for me. It made my lips pucker and overpowered the food I was eating and I just. didn’t. like it. Until I did. Weird? Maybe not so much – this isn’t the first time my taste buds have changed on me. I have a feeling this is largely due to my way of eating – clean, whole foods with fresh herbs and spices. I stopped eating processed food (including condiments), and I’ve found that now when I eat something, I can actually pick out the individual spices and flavors in the dish. It’s pretty cool. The Man loves to test me when he cooks for us at home and asks me to tell him what he used. I’m pretty good at it! 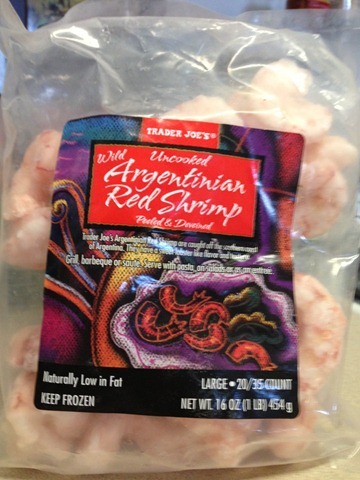 Wild Argentinian red shrimp marinating in a blend of olive oil, lime juice, chili powder, garlic, and fresh ginger. BAM. I really need to get over my fear of the charcoal grill, because this would have made AMAZING grilled shrimp skewers. But because I am a big baby overcautious, I cooked them in a skillet on the stove instead. Good, but not great. This shrimp had a lovely tart and spicy flavor to it – the crisp lime blending with the spicy ginger and chili, coupled with the mellowness of the garlic and oil…although let’s face it. I’d put garlic in anything. However, I’ve found it does pair well with marinades. And speaking of marinades, now that I’ve figured out how easy they are? Yeah. You’ll be seeing more of them in the future! I’m all about easy. Wait. That totally came out wrong. Oh – and can we just talk about this shrimp for a minute? 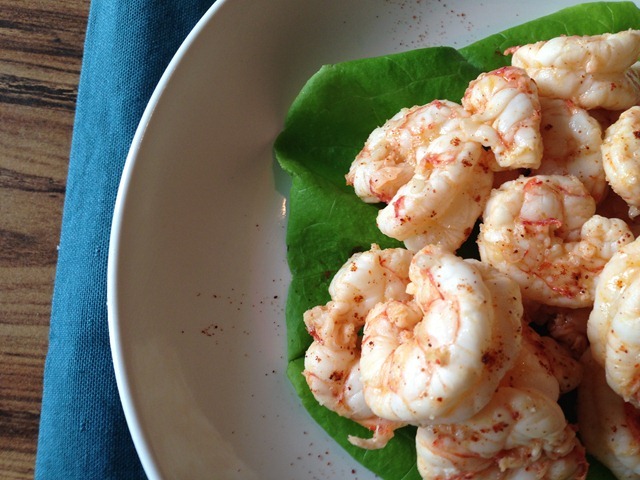 Now that we’ve gotten that out of the way, go fire up your grill and make this shrimp! And then invite me over for dinner. 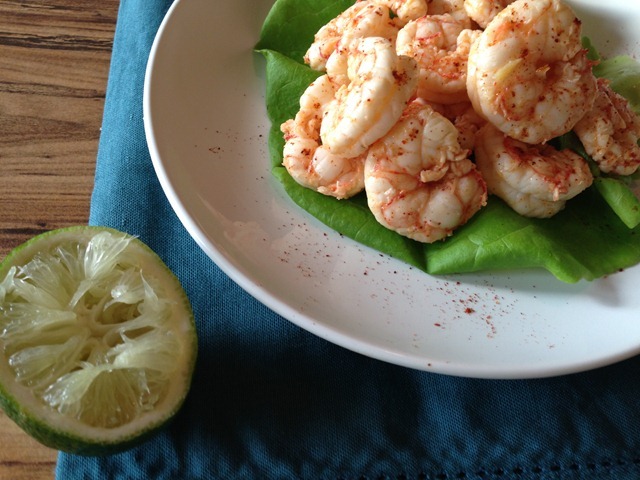 Whisk together olive oil, lime juice, garlic, ginger, and chili powder in a small bowl. 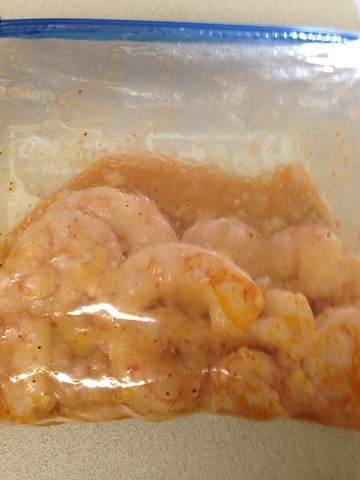 Add your thawed shrimp to a freezer bag and pour in marinade, combining well to ensure shrimp is nicely covered. Marinate for at least 30 minutes. 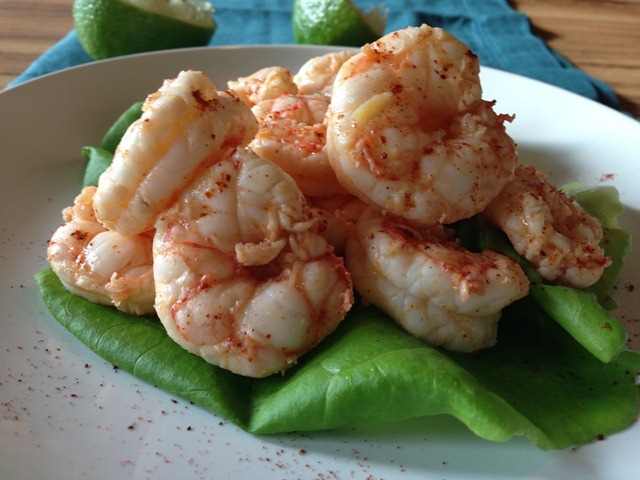 Add marinated shrimp to a hot (medium-high heat) skillet and cook through – only about two minutes per side. Do NOT overcook your shrimp or they will get tough. 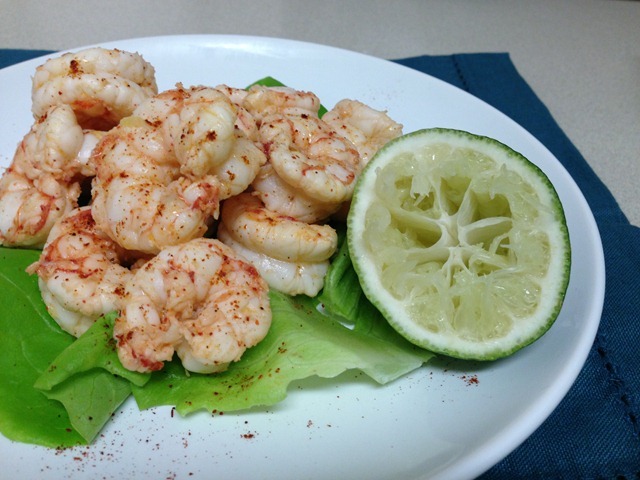 If desired, sprinkle cooked shrimp with a little more chili powder and a squirt of lime for an extra kick. 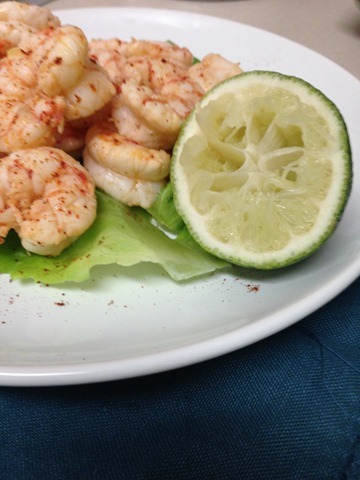 Posted on 30 May 2013 29 May 2013 by BeePosted in Dinner, Seafood, Whole 30Tagged dinner, ginger, lime, seafood, shrimp. Pingback: What I’m Loving Lately | eat. write. run. repeat!